The investors need not worry about the recent correction if you go by the past experiences, in any emerging equity markets they tend to correct by 20% when in the Bull Run phase the only reason behind it is that the funds become overweight, Crude oil hitting the lows and recovering a bit, reversal of the dollar which triggered the rotation of the trade out from not only from the long dollar, Europe, Korea and India of course, and the money was rotated into the stressed Brazilian currency where the Brazil and the Russian stock markets rallied. In any given emerging markets certain sectors like IT stocks, commercial vehicles, banks, cement and infra are always the most attractive. 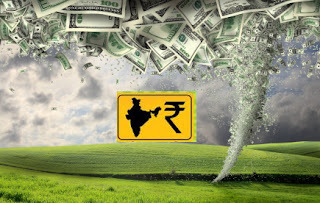 The China is experiencing a bear market rally, and the commodity exporting countries have been forced to rebalance their international investments resulting in a forced selling in India. Even the dollar index for a brief period of time hugged the post 100 mark but there after failed to maintain the momentum. So whenever there is an overweight condition in any emerging markets the reallocation of the funds to other emerging markets is always done to rebalance their international allocations, and after this usual rotation regime India is all set to outperform all the emerging markets in a knockout because the high relative growth comparatively growth reforms always support any bullish market. To add to the present situation in India as on the one hand earnings cycle has almost hit the tank and on the other hand there is ample sequential improvement in the sales of the medium as well as the heavy commercial vehicles, so also the 4 wheeler segment is on the rise. The dragging of the IT sector due to the rupee against the euro is also fagging. Even the property markets are abuzz making the piled up stocks to liquidate and the banking sector’s credit cost will also head up to peak by the third quarter of this calendar year and the sky is clearing up for the sun to shine once again.